From the moment you arrive you can feel It! All Saints’ Day School is a special place! You will notice it in the warm welcome that every visitor receives. You will see it in how the students behave - with confidence, respect and joy. You will observe how dedicated teachers inspire students to appreciate their individual gifts and challenge them to reach for the stars. You will know that All Saints’ Day School values each student, and that everyone in this small and caring school community is important. Recognized for our enriched and challenging curriculum, our goal is to inspire children to discover the joy of learning, encourage their curiosity, and to develop their individual potential. Students obtain a solid foundation through the skilled teaching of language arts, mathematics, science, and history enriched by classes in art, music, foreign language, physical education, technology, religion, library skills, and performing arts. Small group teaching in a supportive environment reinforces our students’ desires to learn, challenging them to think critically and to develop self-confidence. 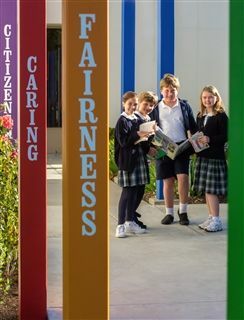 As an Episcopal school, All Saints’ provides a moral, ethical, and spiritual foundation for our students, while welcoming families from a wide variety of faith backgrounds. Children learn respect for others and for themselves; they learn compassion and the importance of ethical behavior; and they learn the value of faith and prayer. During morning Chapel we gather for songs, lessons, and announcements, providing an inspiring start to each day. Founded in 1961, All Saints’ is an inclusive, caring community which values the partnership between parents and the School. Our diverse families are active participants in the life of the School and come from all cities on the Monterey Peninsula and Salinas. Alumni, who have forged strong friendships during their years here, maintain close ties to All Saints’ and to one another long after graduation. Paving the way for academic and personal success, our dedicated teachers guide, instruct, challenge, and nurture each child. We all work together as a community, making our School a remarkable place for children to learn. A vital part of the All Saints’ culture is our varied and active outreach program, which emphasizes the importance of kindness and care towards others. Students in Early Childhood through the Eighth Grade participate in age-appropriate service activities which acquaint students with the joy of serving others. Included among our School’s many projects are bagging pinto beans for farm labor families, singing to members of a retirement community, and donating food boxes and toys for the needy. Through the outreach program, All Saints’ strives to help students build lives of purpose and service in the world they will inherit. The first years of a child’s schooling lay the foundation for lifelong learning and success. Not only are children developing the cognitive, social, emotional and academic skills that set the stage for future years, but they are developing important attitudes towards school, themselves and those around them. All Saints’ is the only independent school in the Monterey/Salinas region which focuses solely on educating students in Preschool through 8th grade, and has been doing so, with a reputation for excellence, for over fifty years. All resources are concentrated on providing the area’s premier elementary and middle school program. An emphasis on character development and high personal standards means that positive patterns of learning and behavior are established early, setting the stage for later years. Children are inspired to discover their talents and the world around them in a safe and supportive environment, fueling a lifetime desire to learn. Consistently applied high expectations for academic achievement and behavior inspire students to be capable, respectful, joyful and confident about their future. All Saints’ graduates are extremely well prepared for secondary school. By assessing a student’s needs, interests and strengths during the eighth grade year, students are not just prepared for a specific high school but for ANY high school.